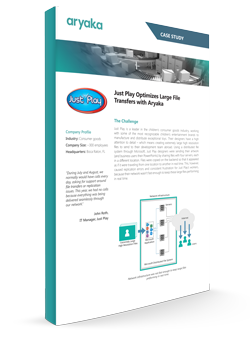 Just Play, a leader in the children's consumer goods industry, had trouble sending high-resolution production files to their offices abroad. Slow file transfers and replication errors were causing major delays in productivity. Learn how Just Play resolved these issues with Aryaka SmartCONNECT and was able to gain back an average of four hours in productivity per day. Why using legacy networks to transfer large files can lead to replication errors and production delays. What requirements ensure seamless connectivity to remote geographies to eliminate file transfer issues. How Aryaka SmartCONNECT eliminated replication errors and helped Just Play to gain back an average of four hours in productivity per day.